2314 Hollenbeck Rd, Stockton CA Jan 10, 2019 (missing from here. 12-1:00 PM THURSDAY 1/10/19( GERMAN SHEPARD FEMALE, blonde tan w darker back hair, nice coat, was very.,clean. Jumped fence when caribiner to leash broke. 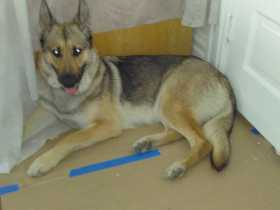 VERY FRIENDLY, MICROCHIP #: 985 113 002 117 966 YELLOW NYLON COLLAR(faded neon yellow) W MY NUMBER, NAME in black magic marker. Tracked through nut orchard heading North. Possibly on Jack Tone Rd toward COPPEROPOLIS Rd/ LINDEN CA. May have been picked up/taken.